Not enough hours in the day! Ever heard that phrase? As an entrepreneur, time constraints is a hurdle that is difficult to overcome. When your schedule is jam packed, trying to prioritise tasks becomes difficult. As a result ignoring certain duties will have a detrimental effect on your business. Most businesses know they need to be on Social Media and know how important a medium it is to grow their business. However Social Media takes time to build and time to post content. Unfortunately what tends to happen is the Social Media is put down the priory list and content is posted irregularly. Therefore having a negative impact on your brand. How do you overcome this conundrum? There is two aspects to alleviate the time constraints on your business if you wish to follow a Social Media Strategy. 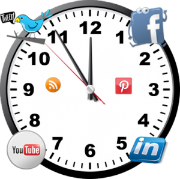 1) Social Media Management Tools and 2) Figuring out what the best times to post are. The beauty about Social Media in comparison to traditional marketing platforms, you can schedule your content to reach your audience. Social Media Management tools allow you to organise your content and help you save time. Despite the apparent advantages of Social Media automation it does come with a health warning! Ensure that you follow up on response or queries from your Social Media community. Facebook scheduling tool – Facebook allows you’re to schedule your content. Click on the clock icon in your status dialog box to find out more. Tweetdeck – Comparable to Hootsuite in terms of its functionality but focused solely on Twitter. Tweetdeck is free to use. Time is of the Essence! Yes indeed timing with your posts is vital. Aim your posts when activity is low, chances are your post won’t engage with your audience. Increase your chances by targeting your content when people are most active. Once you have your scheduling tool set-up, you need to figure out the time your Social Media Community is active. Once you have figured this out, it’s up to you to target your Content at these particular times. What’s the best time to post per Social Media Channel? Facebook – Best times to post are usually morning around 9.00am, 1.00pm and in the evening time after 5pm usually during weekdays. Facebook also allows you to view when your audience is most active. To view this follow these simple steps – on your business page click insights > then click posts > you should see ‘When Your Fans are Online’. Twitter – The best time to tweet is usually between 1-3pm during weekdays and your content will gain the most traction. Most people tend to be on lunch and check Twitter on their mobiles. LinkedIn – For businesses the best time to publish your content is from Tuesday to Thursday between 7.30-8.30am or 5-6pm. Most people tend to view their LinkedIn before and after working hours. Pinterest – The best time to post or pin your content on Pinterest is from Thursday to Saturday between 2-4pm and 8pm-1.00am. It’s understandable for a business who is busy to put Social Media down the list of their priorities. However it’s so important to remember that spending time and effort in your Social Media activities will reap rewards. Once you have a management tool in place and identify when your audience is active, posting content on Social Media should become part of your daily marketing routine. P.S. No Doctor Who references were made in the making of this blog! To learn how New World Digital can help you build your brand on social media simply Contact Us or phone us on one of the numbers available at the top of this page.